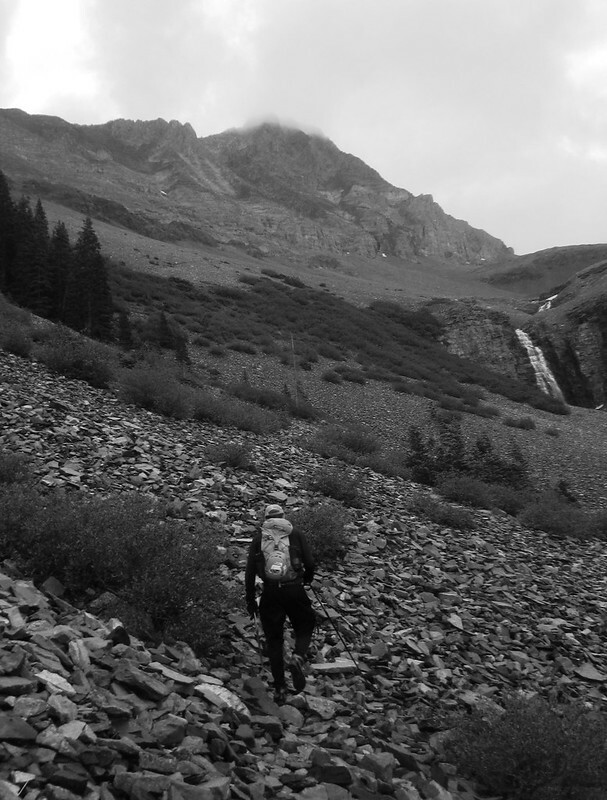 Some time during this past winter, I found myself scheming as to how I would complete the rest of the San Juan 14ers this summer. 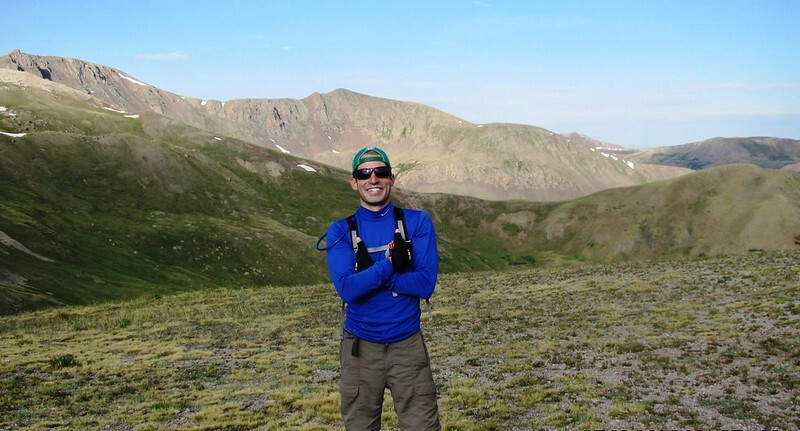 They presented a gaping hole in my 14er resume, as they aren’t easily doable in a day from Denver, and the layout of the range presents challenges in driving from trailhead to trailhead. Showers and thunderstorms likely. Some of the storms could produce heavy rainfall. Cloudy, with a high near 61. South southeast wind around 10 mph. Chance of precipitation is 70%. New rainfall amounts between a quarter and half of an inch possible. 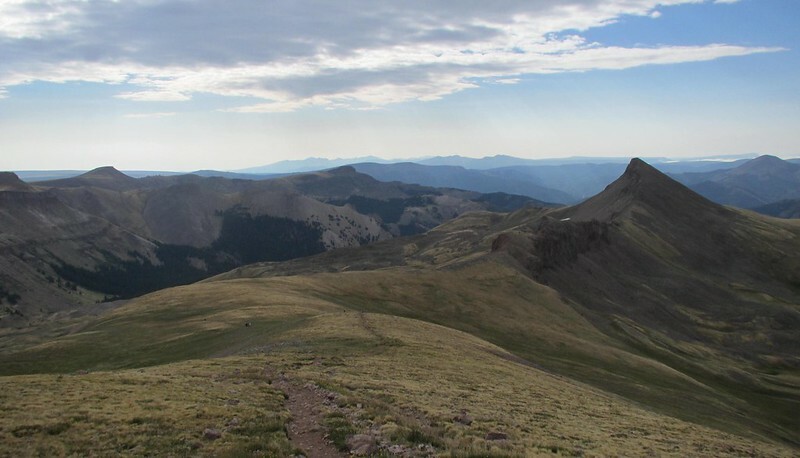 Still, knowing that the forecast can sometimes be wrong, and not wanting to cancel the entire trip solely because of NOAA’s musings, we roared out of Denver Tuesday afternoon bound for Creede, and San Luis Peak. After a five hour drive and the most difficult trailhead search I’ve ever been a part of, we were sawing wood by 11pm, with alarms set for 5am. The alarms could not have come soon enough, as I had shivered through the night in my eight year old North Face Cat’s Meow sleeping bag. I think Dillon was slightly more comfortable in the passengers seat of the car. Some granola and breakfast bars, a last minute gear check, and we were on our way, with the weather looking good. Friendly skies just after 6am. Soon we found ourselves at the saddle above the basin, with a junction that didn’t match USAKeller’s route description. Luckily, there was a helpful hint at our feet. A meeting of the minds came to a conclusion. This must mean San Luis! If it said SOL, we’d be more worried. More valuable signs were to be found along the route, including this gem. I had read a few TRs regarding this route, and knew we would recognize San Luis when it came into view. Before the mountain decided to show itself though, there was plenty of debate. 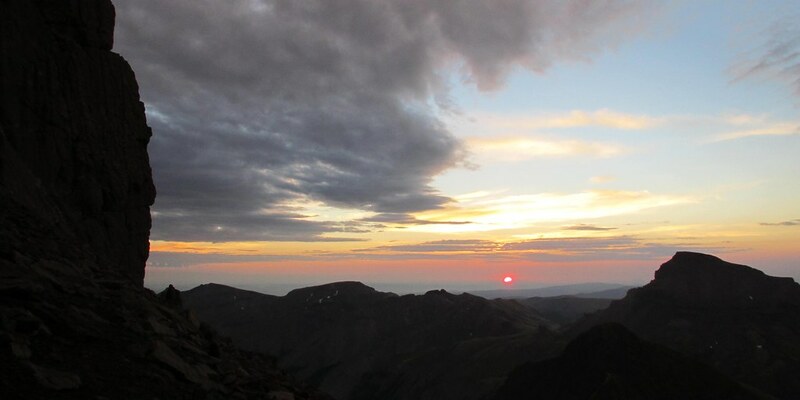 But eventually, arguable the least visited of Colorado’s 14ers greeted us. We contoured around two separate drainages on the undulating trail before approaching the final saddle. This route is incredibly pleasant, and begs to be run. 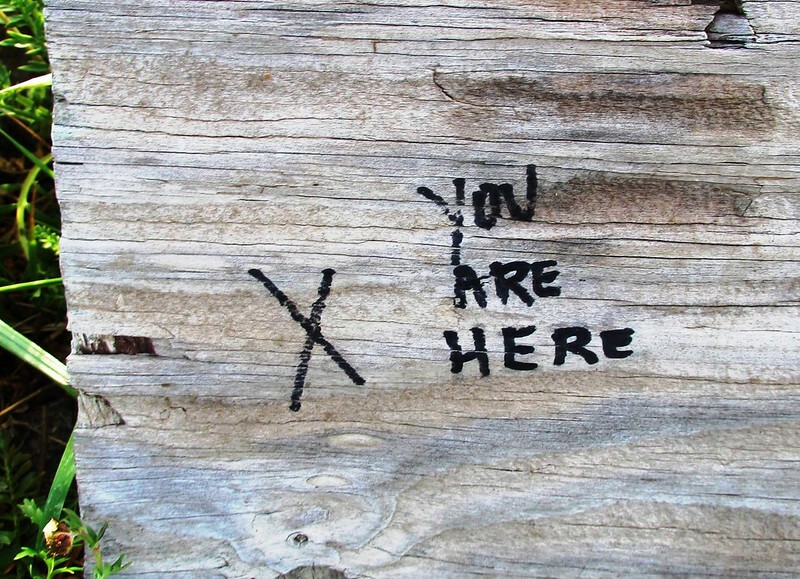 If only it weren’t so remote. Myself challenging the final slopes of San Luis to a duel. Tasting the summit, and #45. 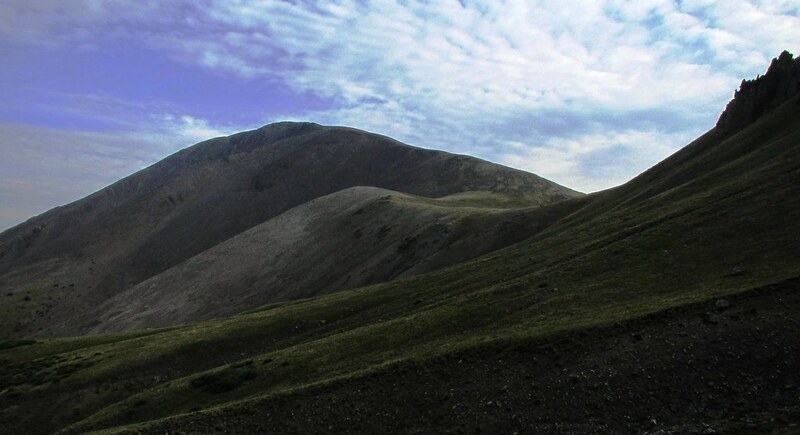 We meandered up the final scree slopes, and found ourselves atop San Luis shortly after 8 AM. 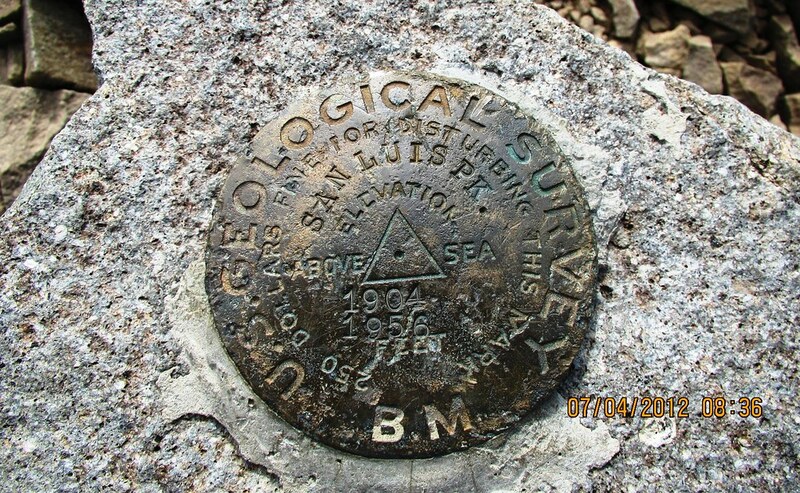 USGS marker atop San Luis Peak. 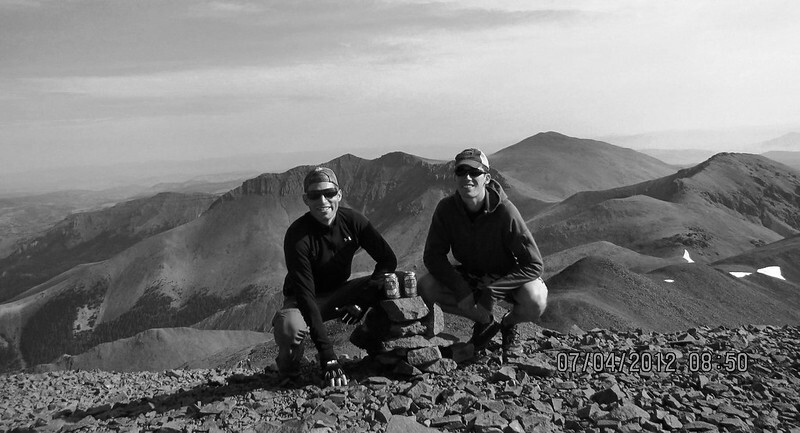 Atop San Luis Peak, with pleasant weather conditions holding and two Dales to boot. We met four other hikers who had ascended from Stewart Creek. One of them remarked how he doesn’t think there is another spot in Colorado where you can see so much without a single road. I haven’t visited Chicago Basin yet, but this is still an amazing spot in this regard. After ~45 minutes on the summit, we began the gradual descent. Dillon starts down from San Luis Peak. Strolling back toward the trailhead. 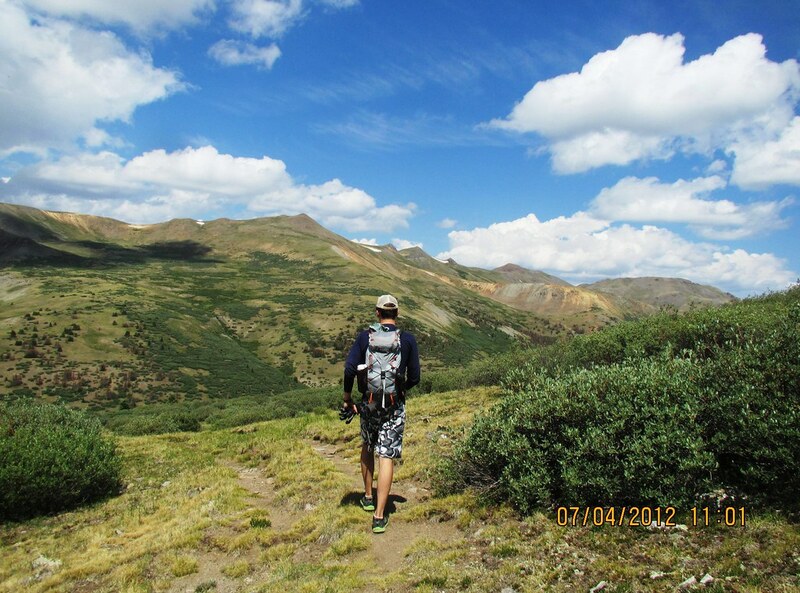 I believe this was 14er #40 for the bathing suit. The trailhead in West Willow Creek. We coasted down into Creede to join in the July 4th celebration at Kips Grill. After a couple of recovery beverages and some fantastic tacos, we hit the road for Slumgullion Pass and Lake City. The drive north on CO 149 was filled with heavy downpours. It seemed Mother Nature was proving NOAA correct, as we rolled into Lake City and took shelter in an internet coffee shop with steady rain falling in town. We charged our phones, picked up a few groceries, and started up the Alpine Loop for the Matterhorn Creek trailhead around 3:30 PM. 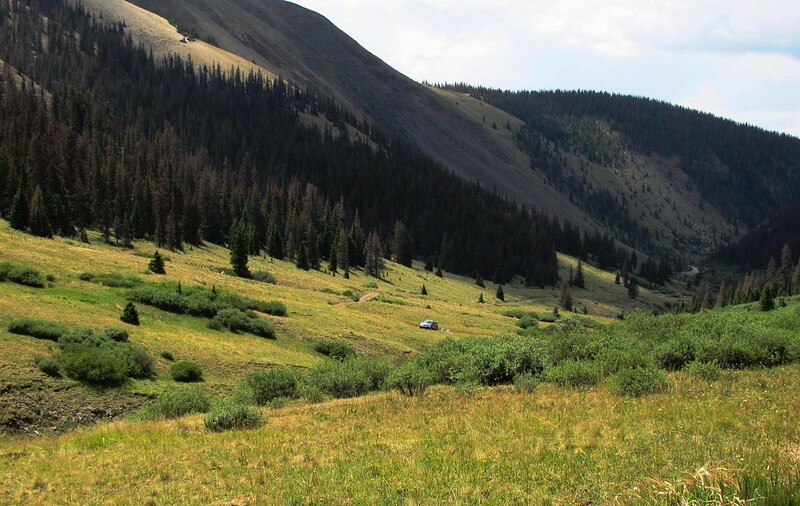 By the time we arrived at the base of the 4wd road (we parked 0.7 miles below the TH), the rain had stopped and we had a pleasant time setting camp. Showers and thunderstorms likely. Cloudy, with a high near 58. South southeast wind around 15 mph. Chance of precipitation is 70%. New rainfall amounts between a tenth and quarter of an inch, except higher amounts possible in thunderstorms. This conversation continued for a few minutes. Eventually, though, as is bound to happen with the two of us, our eyes turned to the sky and our heads grew. In short, we decided that 8.4 miles (from the lower TH, where we were), and 3700′ wouldn’t be too taxing with light packs, and we decided to make an attempt on Wetterhorn then, with a conservative approach and expectations for nothing more than a simple scouting mission. We departed the trailhead at 5:30 PM, and hiked the 0.7 miles to the upper TH in 12 minutes. Ascending toward Wetterhorn under cloudy, yet steady skies. We debated the weather, and while there was a cloud layer above the peaks, it wasn’t threatening. I had some concern, but we decided to push on and turn if we hadn’t reached the summit in a timely manner. Wetterhorn rising over the ridge line. We approached the yellow portion of the ridge, and suddenly a few drops of rain began to fall. A quick glance at Uncompahgre made for an easy decision, especially considering neither of us had been up Wetterhorn before. Safety first, and we have a big goal for next weekend. Let’s descend. Showers and thunderstorms likely. Some of the storms could produce heavy rainfall. Cloudy, with a high near 57. South southeast wind around 10 mph. Chance of precipitation is 70%. New rainfall amounts between a quarter and half of an inch possible. “If there is a weather window, we will be there for it,” were the final words as we headed to bed. A 7000′, 17 mile day in the books. Up like a shot at 3am, we were quickly dressed and hiking at 3:30am. Dillon, having slept in the car again, informed me that an hour of steady rain had let up just minutes before we woke. With the skies partly clear, we cranked it up the 4wd road, once again making the 0.7 miles in 12 minutes. We made quick work of the approach and boulderfield, arriving at the ridge on Wetterhorn after nearly 90 minutes. The skies were a mix of cirrus clouds and clear, and we quickly approached the class 3 portion of the climb. 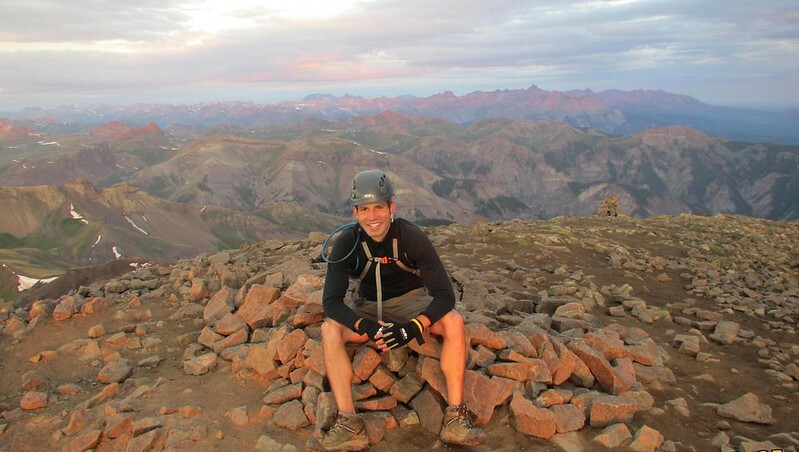 Trekking poles were stashed, helmets donned, and the fun began. 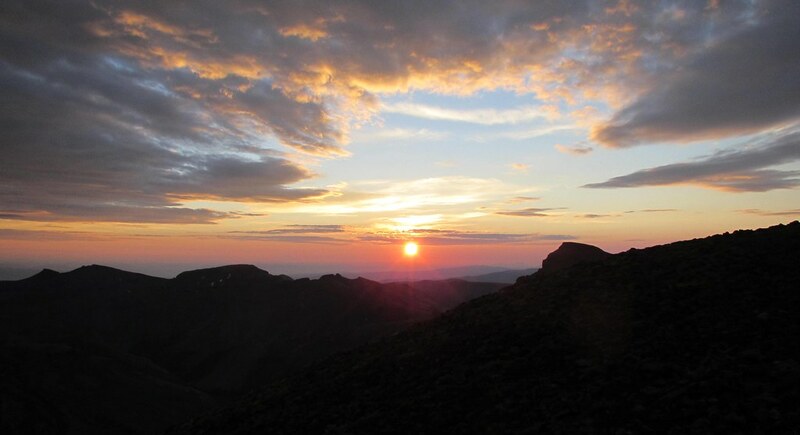 Looking towards Uncompahgre before sunrise. The fantastic rock of Wetterhorn. There was less class 3 on this climb than I anticipated. It can be kept almost entirely class 2/2+ with the exception of the final ~200 feet to the summit. 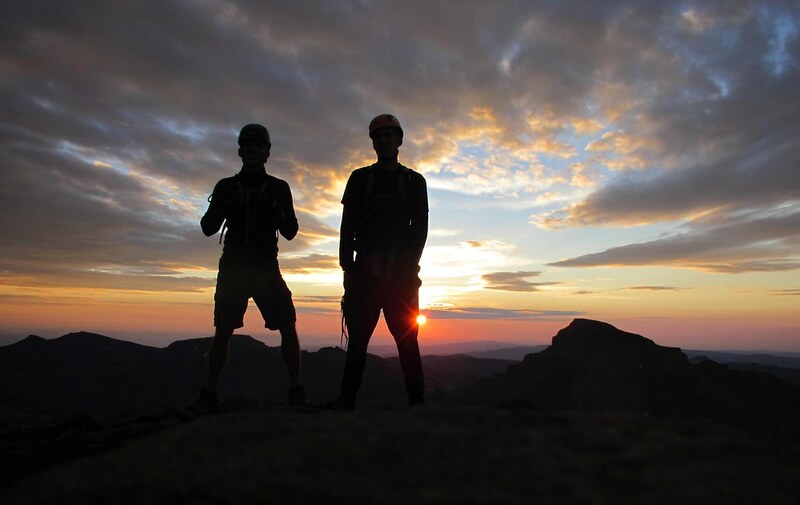 The scrambling ended before it had even began, and we reached the summit just before 6am. 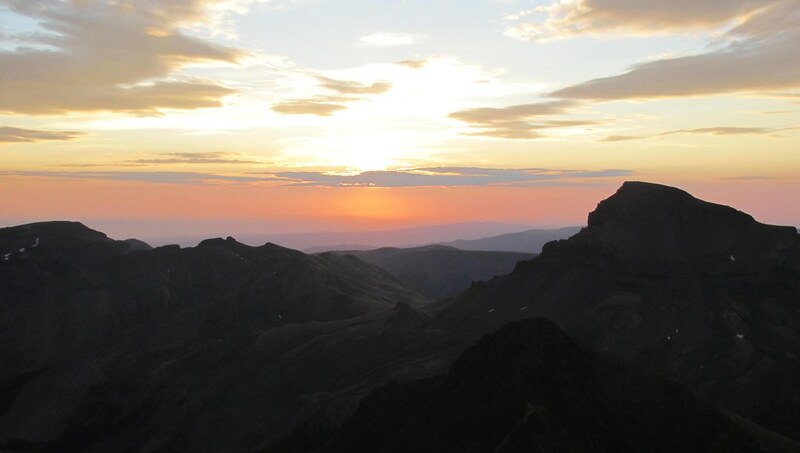 Looking to Uncompahgre just before 6am, from the summit. Our hero on the summit. It was a gorgeous morning. 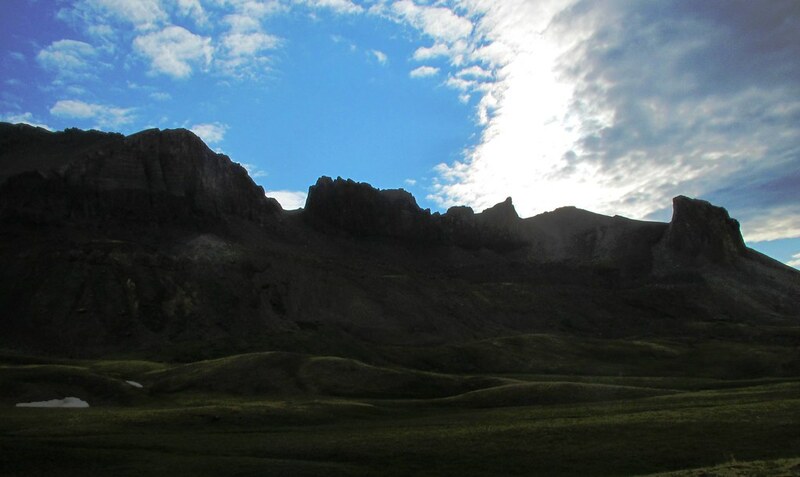 The skies to the west, with the Wilsons, Sneffels and company watching. Despite the forecast and the need to hustle towards Uncompahgre, it was hard to not stop and stare. We are very fortunate to live where we do. 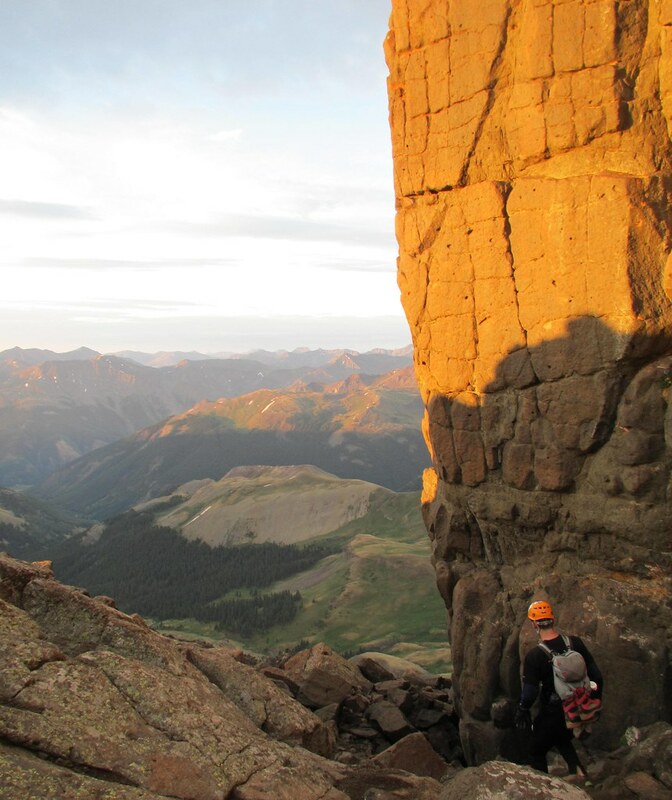 We lost helmets, retrieved poles, and wove through the boulderfield. 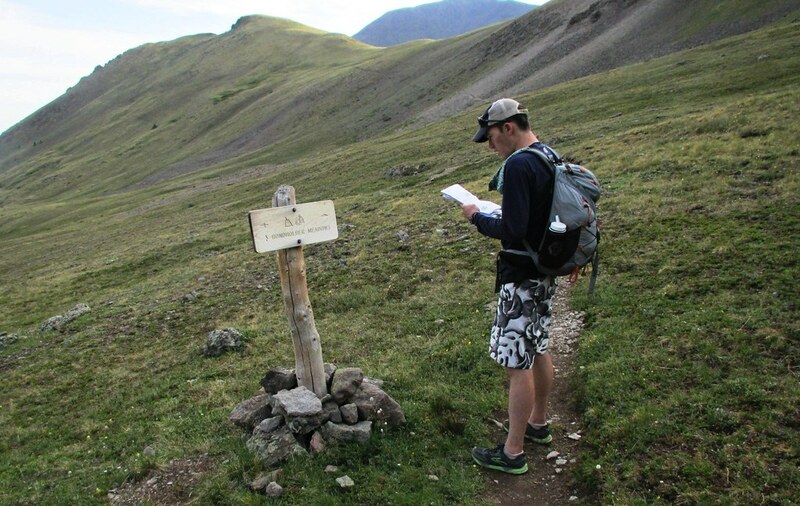 Dillon was able to spot a game trail that appeared to take a high contour towards the saddle with Uncompahgre. I believe it is the same trail mentioned by Dancesatmoonrise in his “Half Cup O’ San Juan” report. We neared the saddle below Matterhorn around 7am. Wetterhorn looked gorgeous. The route to the saddle is pure joy. 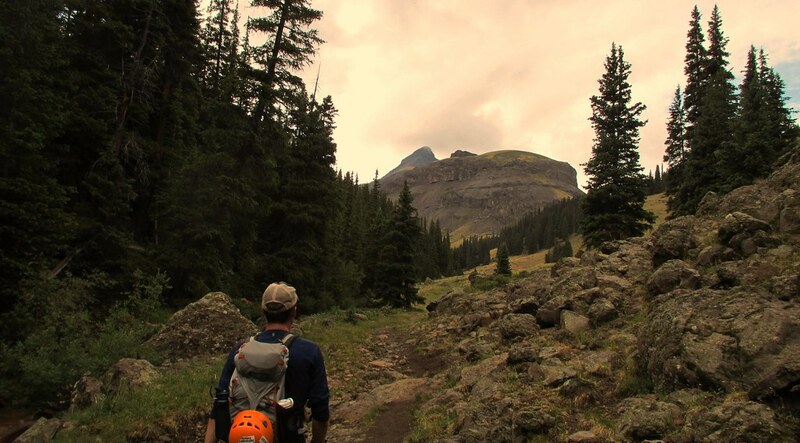 A gradual, soft trail leads toward the hulking mass of Uncompahgre, and it grows quickly as you draw near. Simply gorgeous. I haven’t been to Ireland, but it reminded me of photos / videos that I’ve seen. 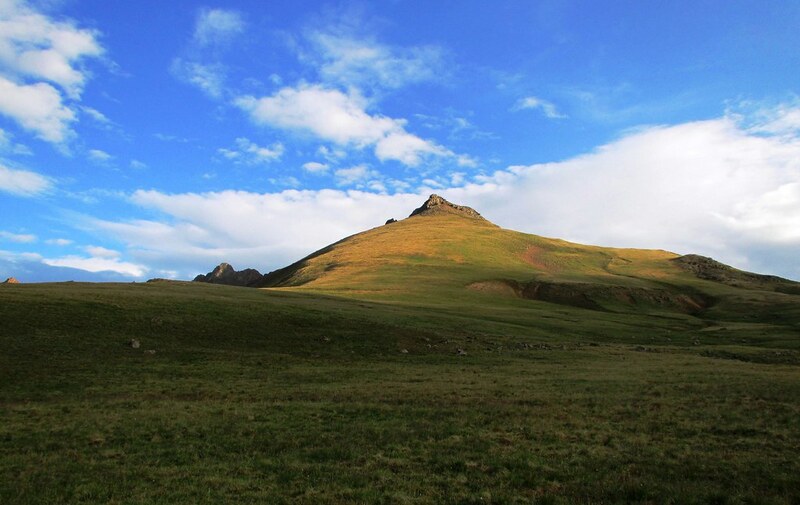 Follow the ridge stock trail if linking these peaks. 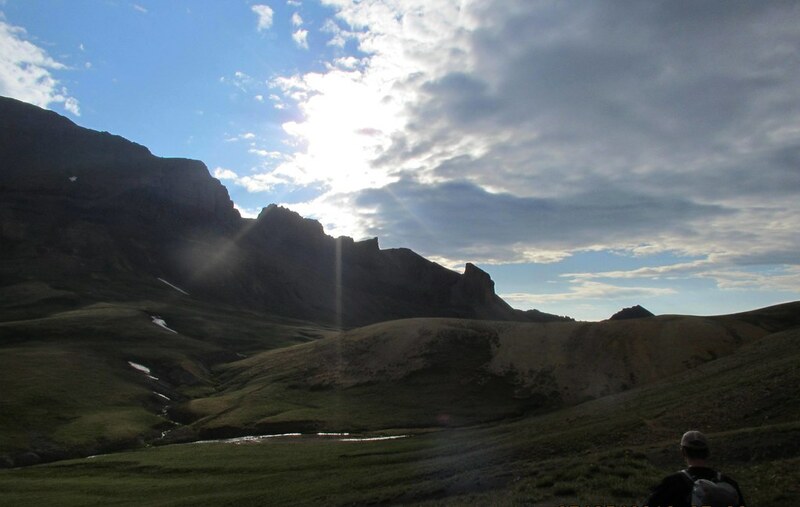 The weather appeared to be holding, and we hiked / jogged toward the SE aspect of Uncompahgre, where we would join the standard route. 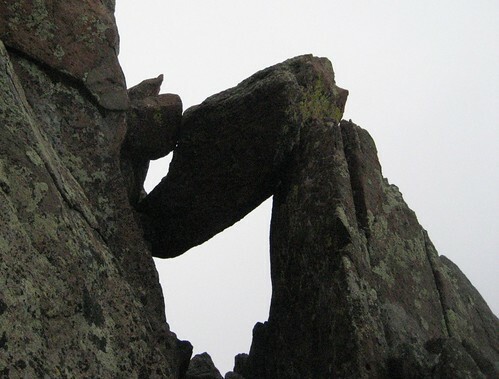 The Peak intimidates for most of the approach, before revealing her gentle side. We joined the standard route and ascended quickly. Does anyone know what the peak at right is called? It captured our attention for much of the hike. 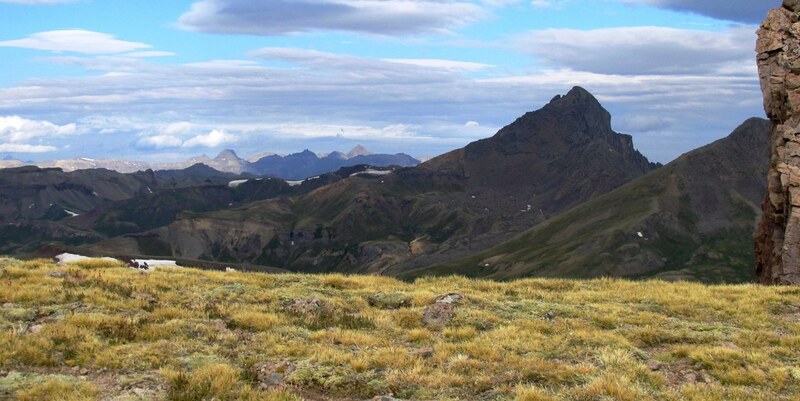 We saw not a soul on Wetterhorn, but must have passed fifteen folks on our way up the monarch of the San Juans. The elevation gain melts away quickly on this gentle route. Wetterhorn from high on Uncompahgre. I ran away as fast as I could. 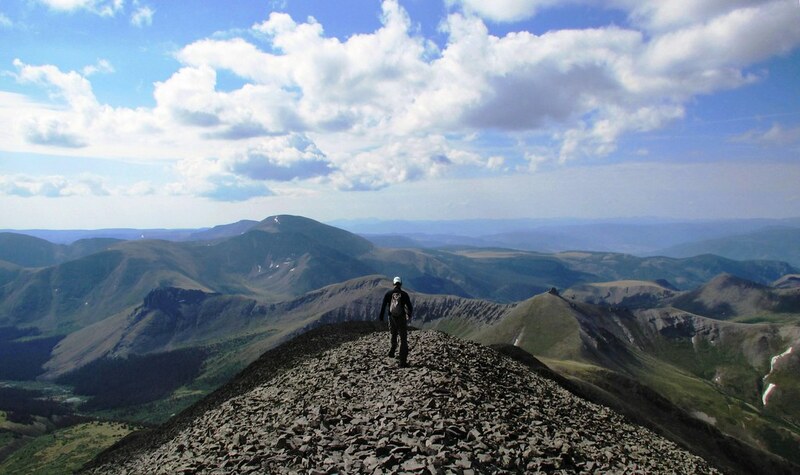 With our eyes to the west, we climbed toward Uncompahgre as quickly as our legs would allow. After a loose class 2 section, the route levels off and the broad summit comes into view. We reached the roof of the San Juans at 9:20am, about 3:10 after leaving the summit of Wetterhorn. Once again, Mother Nature was giving us a window. 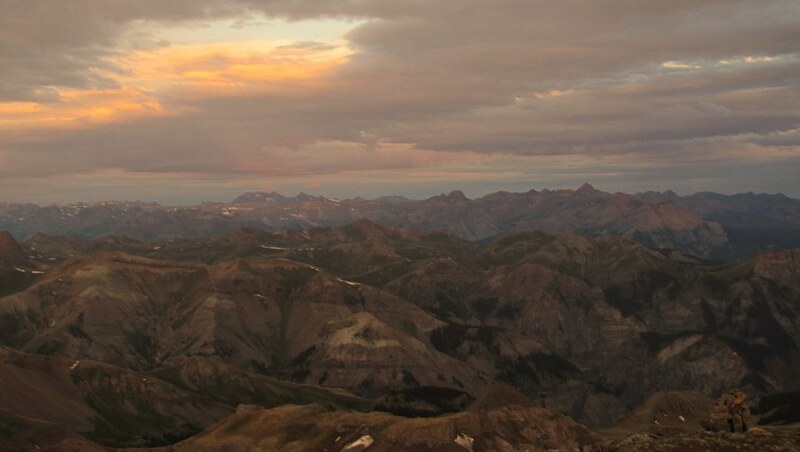 Wetterhorn and the San Juans from the summit of Uncompahgre Peak. 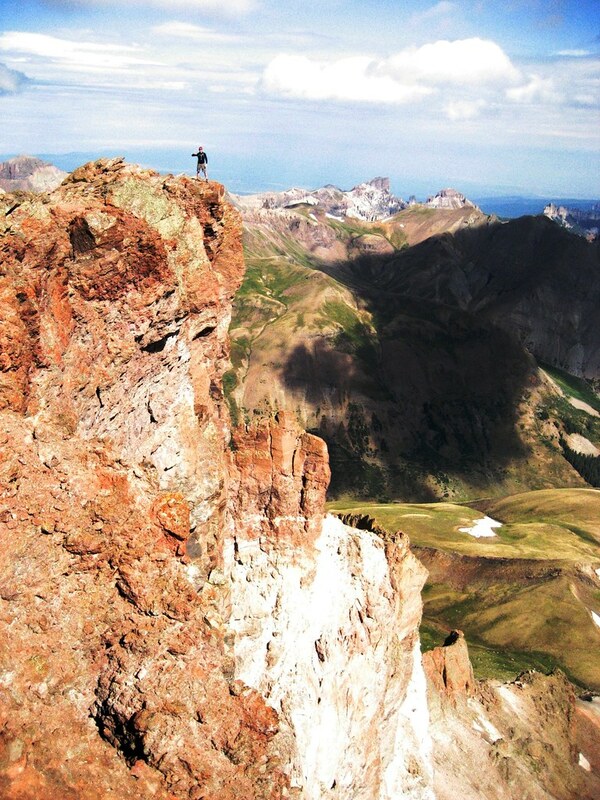 Dillon having fun atop Uncompahgre. 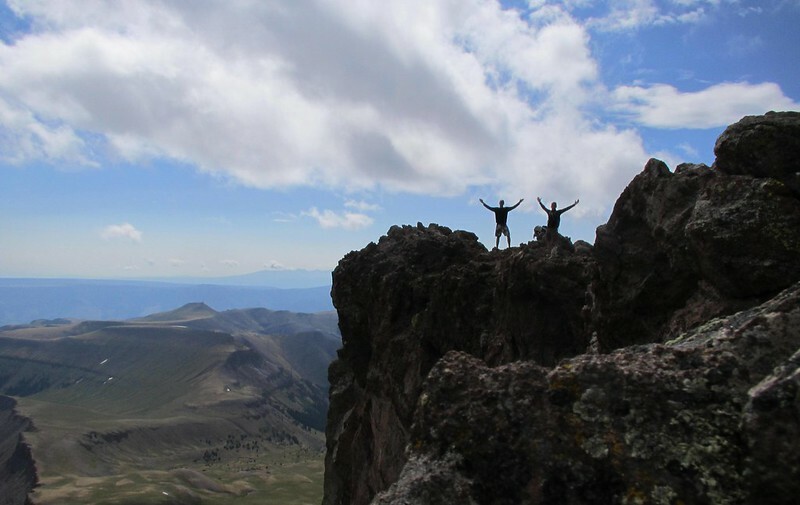 The two of us atop Uncompahgre. Yes, this was with a 10 second timer. Dillon did the running. 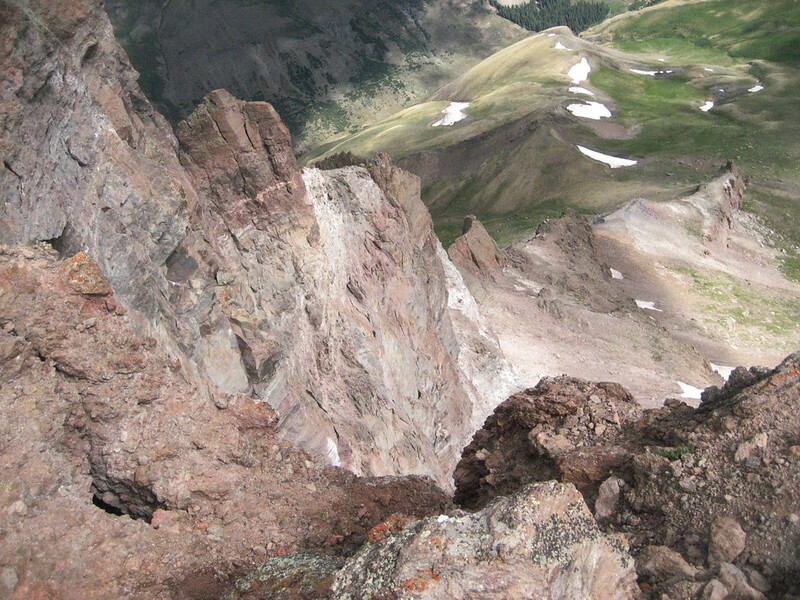 Looking down the sheer cliff from Uncompahgre. We departed Uncompahre around 9:45am, and exchanged words with several parties who were heading for the summit. 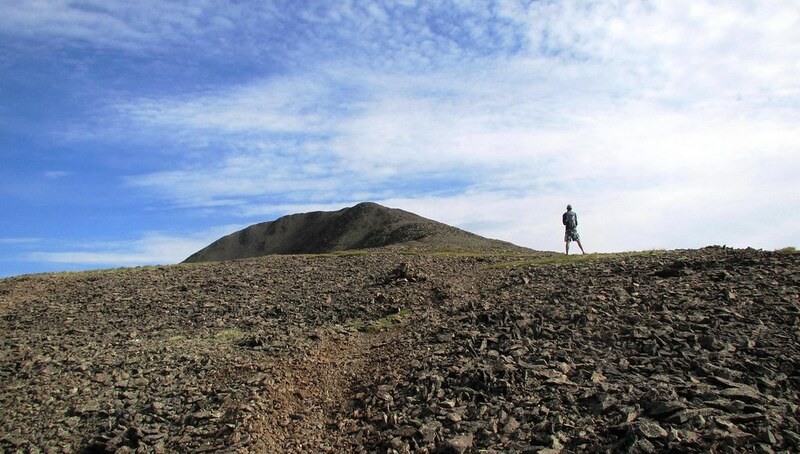 It was a pleasant walk back to the Ridge Stock Trail, which we followed back to the saddle. We dropped back toward Matterhorn Creek under darkening skies, and hit the trees just as the first drops of rain began to fall. We reached the trailhead at 12:30pm, for a round trip time of exactly nine hours. Rain started to fall as we drove back into Lake City, and we discussed how fortunate we had been to hit the weather window perfectly. 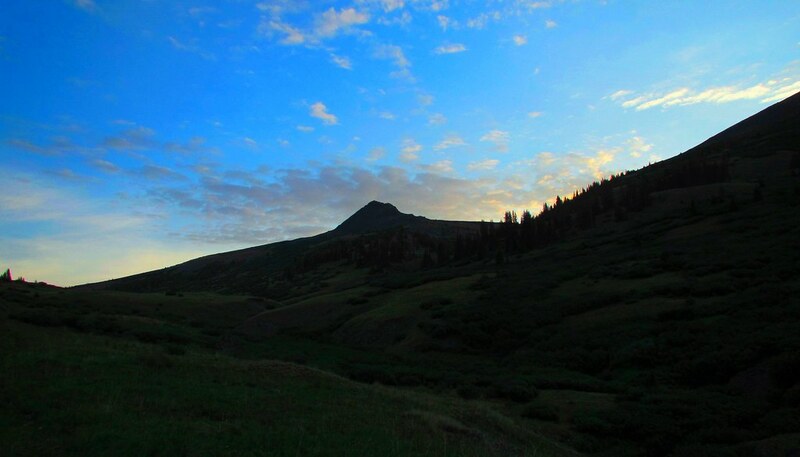 With just one peak left on the agenda, we hit the road for Telluride and the South Slopes of El Diente Peak. The drive via 149 and 50 was long, and we got slammed by a torrential thunderstorm while passing through Montrose. No views of Sneffels were to be had while passing over Dallas Divide, and a steady rain greeted us as we pulled into Telluride. After re-fueling at Brown Dog Pizza, picking up some last minute supplies and verifying the trailhead directions (thanks gonzalj! ), we took 145 south over Lizard Head Pass. As we descended, the rain stopped and we were surprised to actually get a view of Lizard Head itself. The dirt road to the South Slopes trailhead is easily doable in any vehicle, and as we pulled into the parking lot, El Diente Peak stared us down under ominous skies. El D watches us. The skies eventually parted and we were graced with a sunny evening as we turned in for bed early. Showers and thunderstorms likely. Cloudy, with a high near 59. South southeast wind around 15 mph. Chance of precipitation is 70%. New rainfall amounts between a tenth and quarter of an inch, except higher amounts possible in thunderstorms. We set off at 5am, and followed the gentle trail 2.25 miles through meadows and forests to the following sign. The left option goes toward Navajo Lake, while right leads into Kilpacker Basin. I think we covered these first few miles in ~45 minutes; the trail couldn’t be much more friendly. This sign greets you after 2.25 miles. We knew that we had only gained 200′ of elevation in the first 2.25 miles, and were fully prepared for El Diente to bring on the pain. Before getting down to business though, another half mile must be traveled, where you’ll cross Kilpacker Creek and get the classic shot of El Diente with it’s waterfall. 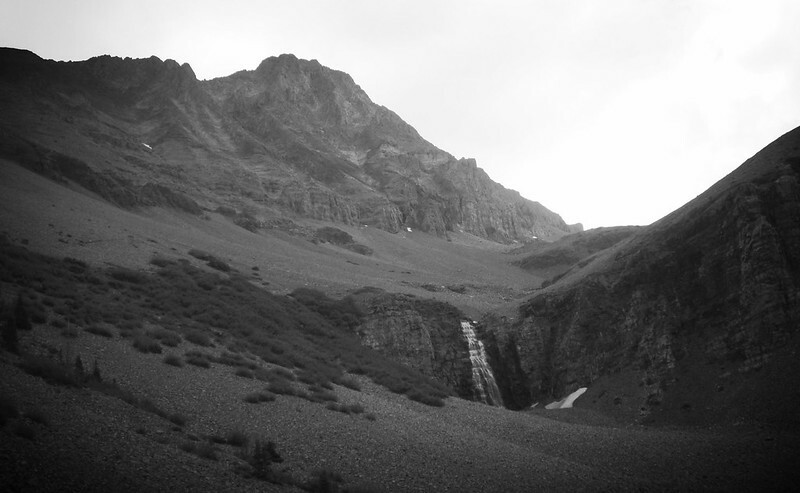 Ascending the scree toward the upper basin, with El Diente playing peek-a-boo. The weather situation around 6:45 AM. More weather. We picked up the pace so as to be in position if Mother Nature did grant us a brief window. Looking up the loose trail toward El Diente and it’s connecting ridge with Mount Wilson. 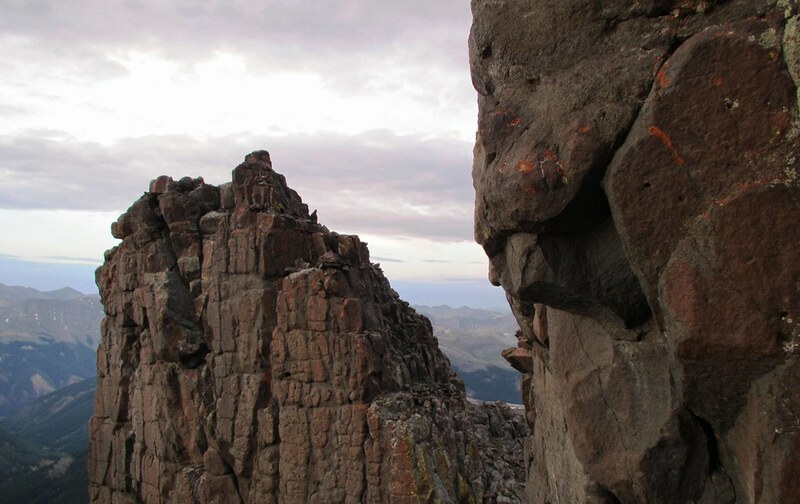 The elevation gain comes quickly as you ascend the scree, and before long we were beneath the Organ Pipes, staring up toward the notch in the ridge. Another quick check with the weather showed that is was still the same as it had been all morning. With broken clouds around the Wilson massif but a persistent cap sitting over El Diente, and no indications of storms or precipitation in the vicinity, we scrambled quickly to the ridge. Dipping toward the north side of the mountain, we found ourselves on the summit at 8:30am, just a few feet up into the clouds. Dillon looking down into the abyss. This is a small summit, and the clouds around us provided a very eerie feeling. We spent just a few minutes on the summit before beginning the descent. Myself on top, just before starting the descent. Looking along the connecting ridge with Mount Wilson. Just below the clouds on the descent. Dillon carefully descends. This is a very loose area. 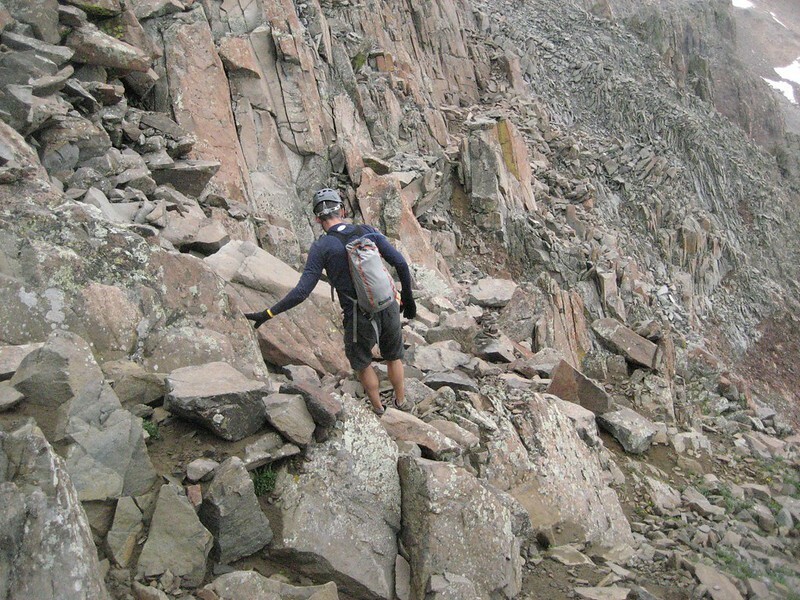 We carefully picked our way down the upper route, and soon enough had reached safer ground in the basin. Removing our helmets and taking a moment to relax, we looked back to El Diente, thankful for safe passage on a dangerous route. The weather was still holding, and the summit had come out of the clouds. Careful to not roll any ankles, we hiked out of the basin, admiring the low clouds that continued to play just above the basin. I’ve switched to trail shoes for most summer climbs, but the rock along this route is terrible, and I was glad to have my boots. With ~46 miles and 17,300′ of vertical on our legs in just over 48 hours, Dillon somehow still had energy to burn. 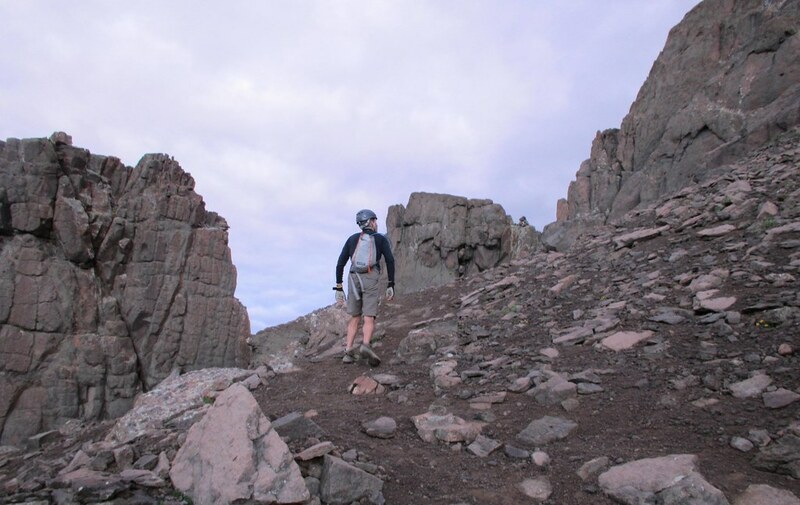 I convinced him to attempt a first ascend of El Diente’s sibling, this 4′ high rock outcropping in the basin. Dillon with another new summit. Unfortunately, this one isn’t ranked. Admiring the clouds on the descent. Kilpacker Creek is gorgeous here. 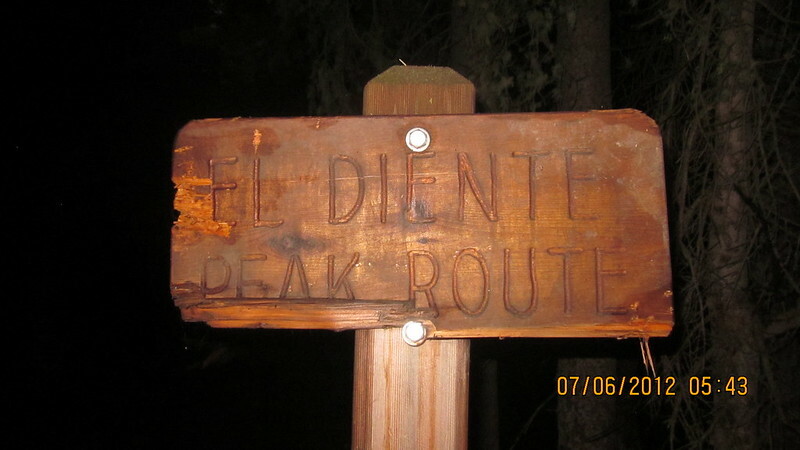 The classic shot of El Diente along this route. Back at the trailhead at noon, about 7 hours for the round-trip. 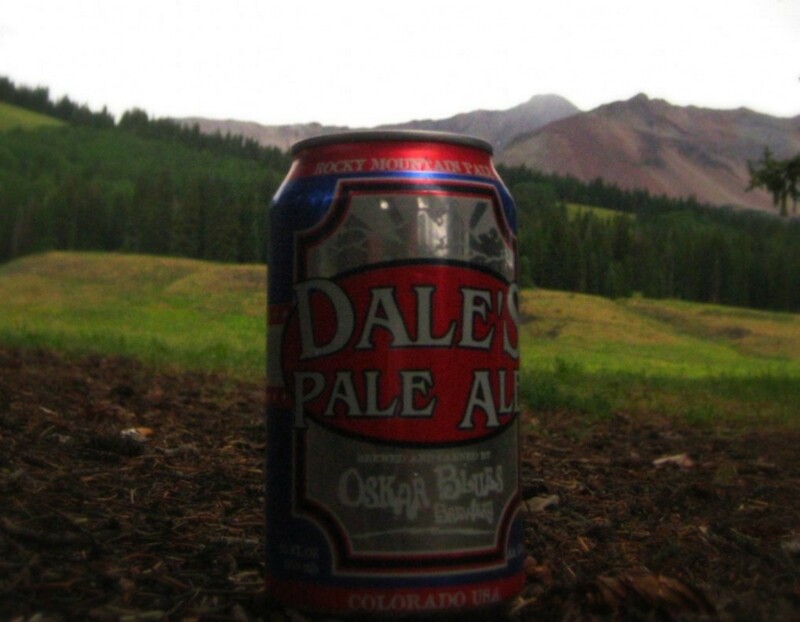 After 50.5 miles, 17,300′, 4 new summits, and a whole lot of worrying about the weather, we enjoyed Dales on a cool summer afternoon at the Kilpacker Trailhead before heading into Telluride for Mexican food at Emillio’s. This was an incredible few days in the San Juans and a great way to spend part of this long weekend. I think Dillon and I both learned just how valuable early starts can be, as we just snuck these mountains in while dodging some of Mother Nature’s own fireworks. Here’s to seeing everyone in the hills again soon!